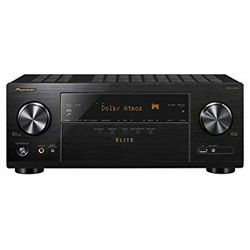 The main aim of the Pioneer VSX-LX103 review is to clarify the mid-range 7-channel AV’s peculiarities. 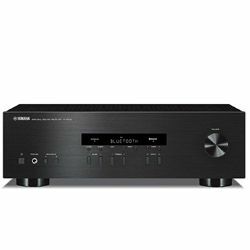 It doesn’t hit the total output power and a power per channel but has plenty of inputs and outputs to deliver a good movie theater experience. It permits to stream content from both the Web services and USB flash drive. Its dual-zone capability allows playing content in two rooms simultaneously and you can control its performance via smartphone. The unit uses its branded MCCAC Pro tech for speakers’ calibration with the included mic. The amp’s front panel is neat with the large fluorescent screen and two large buttons – input selector and volume control. The USB port the phone jack is also there for fast and convenient connections. 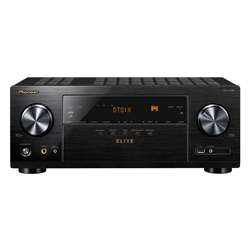 One of the Pioneer VSX-LX103 specs in demand is its FlareConnect to arrange the wireless multi-room system at home. Its Ultra HD upscaling can turn 1080p content into 4K. Besides, the HDMI pass-through lets video content transfer through the AV without distortions to save picture quality. 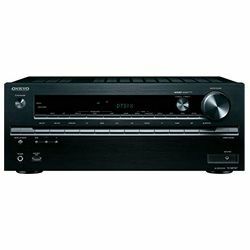 The AV provides streaming content from Pandora, Tidal, Spotify, and Deezer. It has a digital tuner, but the antenna is weak that’s why some stations do not come in. VSX-LX103 has the Phase Control function that’s responsible for delayed bass compensation to increase sound sync. The sound is deep, immersive, and realists, it is oriented to the object due to the combined codec compatibility. The surround sound options allow using the rear speakers with a diversity of sources – broadcast TV from the cable box, for example. DTS:X provides 3D sound from the sources with more even and common sound. 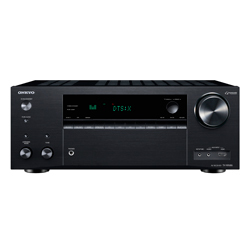 The built-in Pure Direct mode doesn’t let any interferences spoil the sound clarity. 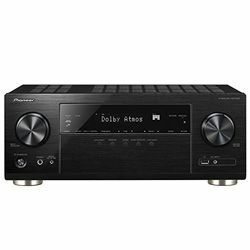 Pioneer VSX-LX103 supports speaker 7.1:5.2 configuration and 2 subs. It comes with both built-in Wi-Fi and Ethernet output. The unit comes with the built-in Chromecast for streaming content from the mobile device to the speakers. There is manual instruction that is very easy to understand. You can control the amp’s volume and turn it on/off via TV remote. The settings are not the easiest. Each of VSX-LX103’s HDMI ports supports 4K and its content protection, as well as Wide Color Gamut that is great in case of upgrading the other components of the system. Taking into consideration the AVs power and settings, this device would be great for a medium-size room with low ceilings. Its high-end connectivity and multiple settings give the possibility to arrange the home theater system with the latest technology.